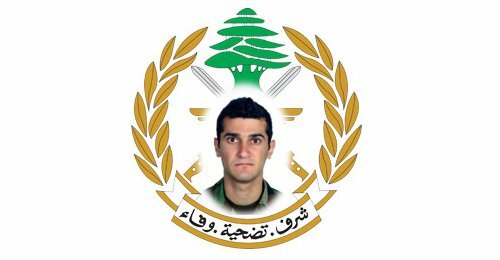 Mahmoud Ali Noureddine , the Lebanese army soldier that was killed while dismantling an explosive device outside the town of Arsal on the border with Syria on December 3, 2014. Noureddine 29, hails from a Nabatieh town in south Lebanon . A Lebanese soldier was killed while dismantling an explosive device outside the town of Arsal on the border with Syria on Wednesday, security sources said. The death comes a day after gunmen who crossed from Syria into the nearby mountainous border town of Ras Baalbek killed six Lebanese soldiers when they ambushed a patrol near the border. Two more soldiers were wounded in Wednesday’s blast, which occurred in the outskirts of Arsal, the sources said. The national news agency also reported the incident. Spillover from Syria has repeatedly shaken Lebanon. Militants attacked and briefly seized Arsal in August and took a group of soldiers prisoner when they pulled out. RIP Brother for doing your highest duty of honor. May God bless your family and help them in time of their grievence.